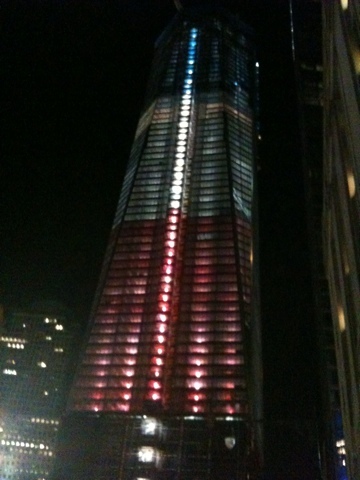 I took this pic last night of the world trade center memorial. It was pretty warm out so i decided to pedal into manhattan and do some touristy type stuff. I went through times square and down to west village to meet up with my shorty for some dinner on the pier. All and all it was a great night. Living in nyc is something i'll never forget. So much history here in gotham its unreal. While in times square aka "the center of the world" i watched people distribute information claiming 9/11 was an "inside yob". Insane. I'm not going to sit here and say anything about that... i just wanted to say that i feel for the families who lost loved ones on that tragic life altering day. my heart really goes out to them. There's been talk of car bombs over the weekend in nyc or washington dc. I refuse to live in fear. no matter who "they" are, i refuse to let them win. be it our own government or haters of the aforementioned. I'm going to sign up to take the first of a few tests to join fdny. The chances of being selected are slim to none. But i cant work in bike shops forever right? I consider myself and average jo(s)e and have yet to really find my "calling" in life. The process to get on takes a couple years... Who knows where i'll be in 2015 but i do know i move with a peace of mind few have the luxury of. Knowing i have no blood on my hands helps me sleep at night. i make decisions based on the rules of love. i wish more people (especially those in "power") could do the same. I'm writing this post from my iphone while waiting for my brick oven pizza... I'm american and proud of it. Hustle on mang, haha good stuff. I like how you still manage to get some laughs in.